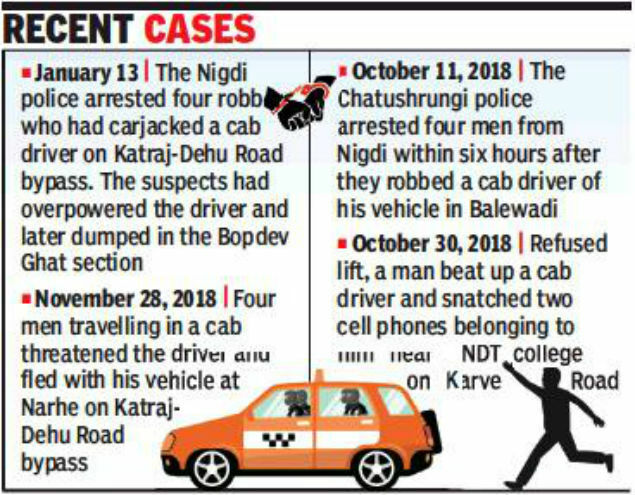 PUNE: Two unidentified men threatened a cab driver waiting for passengers on Satara Road in the early hours of Monday and robbed him of a cellphone and cash, collectively worth Rs11,000. The cab driver Suraj Iranna Shahabade (21), who hails from Solapur and currently resides at Dhankawdi, has lodged a complaint with the Dattawadi police. Sub-inspector of the Dattawadi police Kuldeep Sankpal, who is investigating the case, said that the complainant Shahabade is pursuing a commerce degree from a college in Solapur. “During the vacations, he had come to Pune and started working as a driver with a cab aggregator to help his family,” Sankpal said. Sankpal said that on Monday, around 4.30am, Shahabade was to pick up passengers near Panchami restaurant on Pune-Satara Road. “He had reached there on time and he was waiting for the passengers when two men riding a motorcycle on the wrong side of the road stopped near the cab,” he said. The men allegedly threatened Shahabade and forced him to step out of the vehicle. As soon as he got down, the duo snatched his cell phone and Rs830 from his wallet all collectively worth Rs11,000. They later fled on the motorcycle. Following the incident, Shahabade immediately approached the Dattawadi police and lodged a complaint. “We have registered an offence of robbery and launched a search for the duo,” Sankpal further said. Over the last few days, this is the second incident of a cab driver being robbed. In the early hours of Friday, two masked men threatened cab driver Deepak Ingle, who was waiting for passengers, near a PMPML bus stop along the Katraj-Dehu Road bypass. Ingle lost his car and mobile phone, totally worth Rs6 lakh, in the robbery.